Does InMotion Work in My iPhone and iPad? As the pace of life now got noticeably faster compared to a few decades ago, a lot of people now take their businesses with then wherever they go. They need to have constant access to their websites, online stores and ecommerce site. More importantly, they need to be constantly in communication with their businesses either through e-mails or other modes of modern communication. 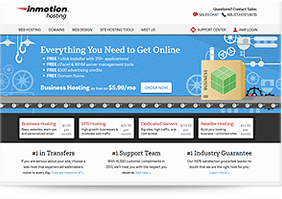 This is why webhosting companies, more specifically InMotion hosting, supports mobile device compatibility, designed for business people on the go take their businesses with them wherever they go. A decade ago, bringing their businesses with them means that businessmen need to find computer terminals in their hotels where they can get into their virtual business world through their desktop computers. Still a few years later, mobility took another meaning as desktop computers gave way to laptop computers which brought more advantages than their desktop counterparts as laptops are more mobile and has wireless connection capabilities. However, the age of mobile computing and mobile business now has a more apt meaning as mobile computing has become more mobile than ever before, that is with the advent of smart phones and its counterparts. Mobile phones are smaller, more compact but is often far more powerful compared to our desktop computers a decade ago. InMotion takes mobile computing a step farther as it is among the number of webhosting companies that support and has mobile device compatibility, more particularly with iPhone and iPad. Yes, it is true, InMotion works well in your iPhones and iPads and other iOS based devices. What should I do to setup my iPhone and iPad to receive emails via InMotion? If you are an owner of an iPad or and iPhone or a device that is iOS based, you can use that device to check and read your emails wherever you may be. However, in order for your device to receive your emails, you need to setup and configure your device. The following guide is for setting up of iOS devices such as iPhone and iPad. On your device’s home screen, look for the “Settings” icon, which is typically represented by an icon with three gears and select it by clicking. Once inside the Setting screen, look for the “Mails, Contacts, Calendars” and once again select it by clicking. On the “Mails, Contacts, Calendars” screen, click the “Add Account” button which in turn should take you to a screen with a number of email services to choose from. Select the “Other” tab which should be found at the bottom of the screen. Then under the “Mail” section, select the “Add Mail” Account. Fill in the required information on the boxes provided in the “New Account” section. The Address shall be your full email address and the password shall be the corresponding password for that email account. As soon as the information is submitted, your iPhone or iPad should look up for the account and process the settings then should automatically bring you to the next screen. You will then be asked to choose between IMAP or POP but being a mobile device, it is recommended that you choose IMAP. The reason for this is that emails are not stored on the iPhone/iPad. On the Incoming Mail Server section, enter the required information. Host name should take the following form: secure##.webhosting.com. The ## should be represented by the server number. The server number can be found in your hostname. For instance your hostname is cathleen07.inmotionhosting.com, your server number then is 07. Username should be your full email address and the password the corresponding password for that account. Then, under the Incoming Mail Server, once again, you need to enter the same information that you entered before. The click on the Save button which should be found on the upper right corner of the screen. After clicking Save, your iOS device should process the information and once processed, your device should now be ready to receive emails. What other applications does my Iphone or Ipad support via InMotion hosting? Your iPhone or iPad is also compatible to run an online using the PrestaShop Mobile Store. In fact, it is not necessary to have a separate PrestaShop Mobile Store version in order to run it on your iOS devices. InMotion makes this necessary as it is among their tools for their ecommerce hosting. This is an application that is used to manage your PrestaShop store from the comfort of your iPhone or iPad. Also available are additional mobile applications that allows administrators to view reports and orders. The MobiCart is a service that allows for the creation of both iOS and Android applications for the Mobile PrestaShop .